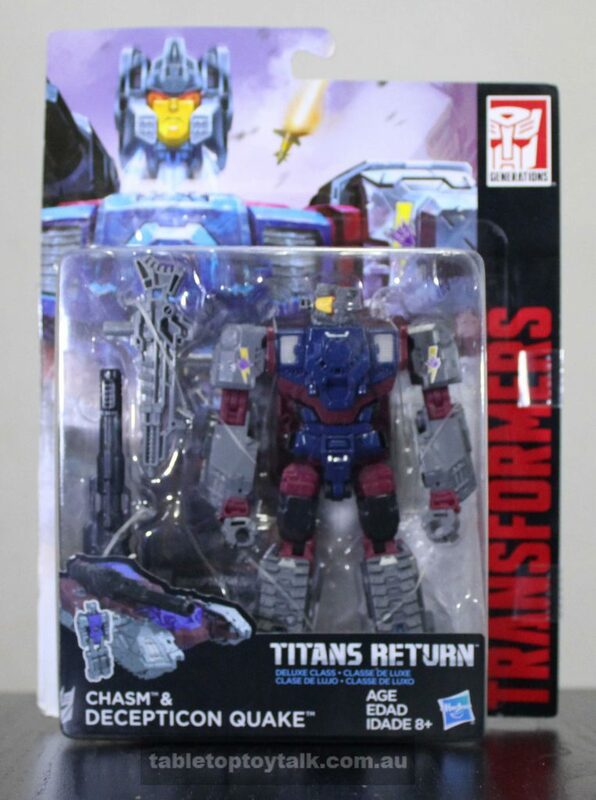 The Titans Return line has hit the shelves in a big way and it’s good to see a lot of the old G1 characters have another go around, with updated designs and modern engineering. 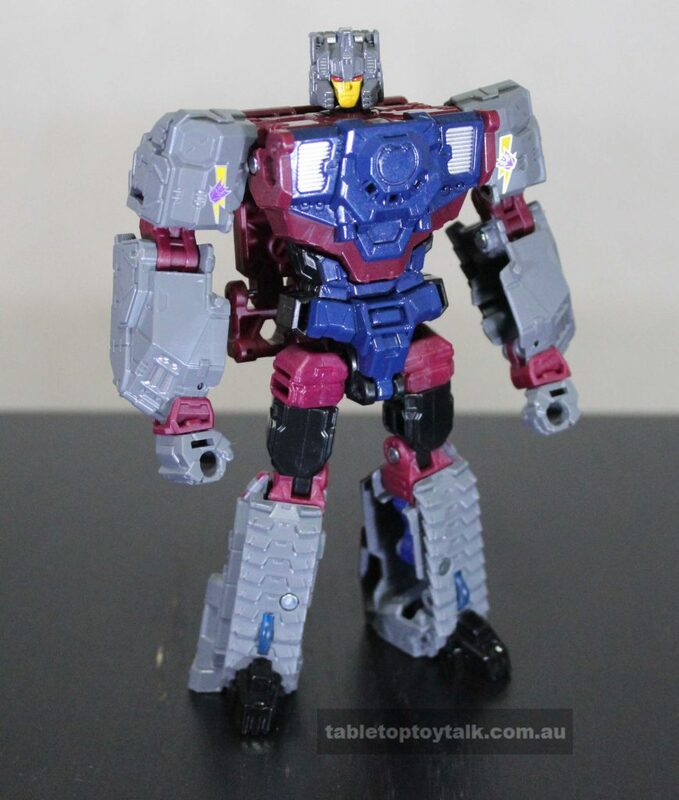 This time around it’s Quake’s turn to receive the Titans Return treatment. 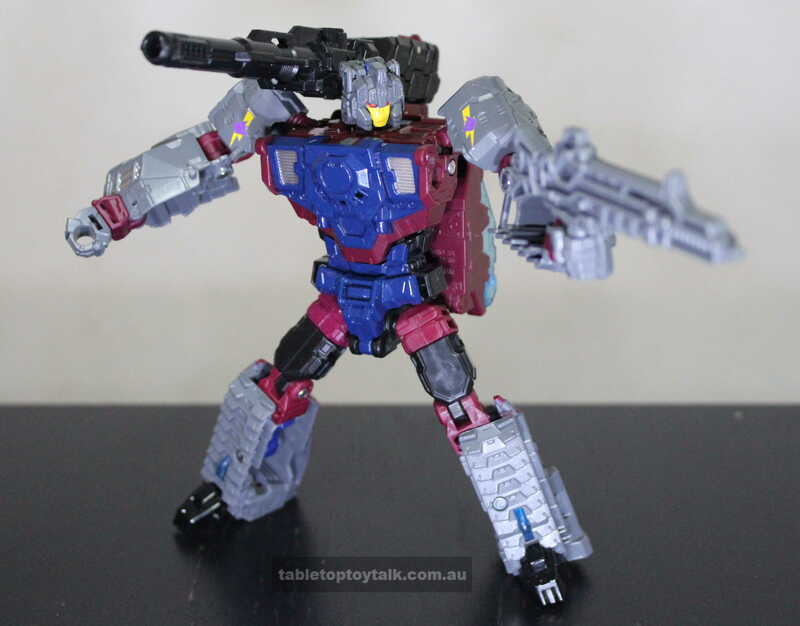 Quake has turned out to be a bit of a surprise for me since I wasn’t aware that he originally was a Targetmaster that was released in 1988. Box front – and yes, his head has come loose inside the package. Quake’s character is that of a berserker, where once he hits the battlefield, he won’t stop until everyone and everything is reduced to ashes. 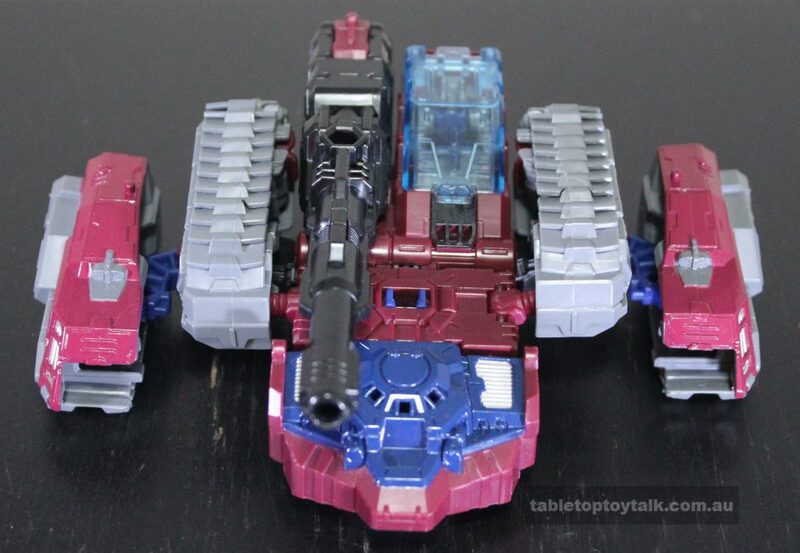 Now that he’s been paired with Titanmaster Chasm (who can create portals), we have the extremely dangerous combination of an unstoppable force of destruction with the ability to teleport enemies and objects around at will. 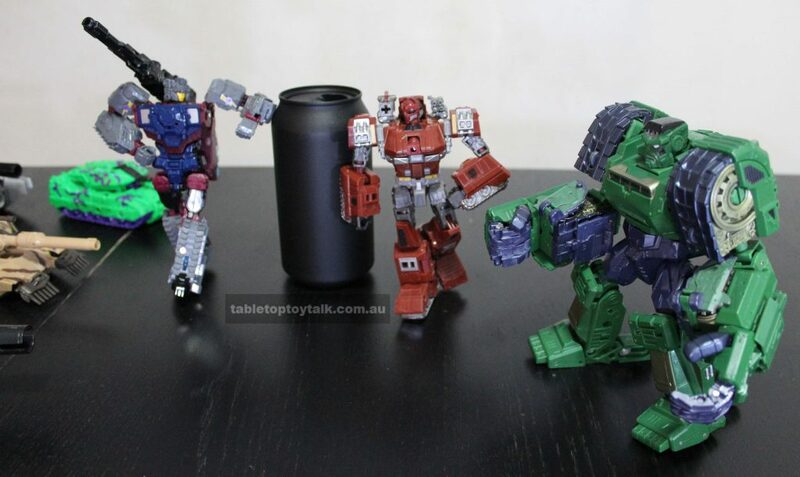 Quake shares a mold with Titans Return Hardhead (with Titanmaster Furos), and while he still retains his tank vehicle mode, he’s now adopted Hardhead’s “H-tank” format where the left and right treads are split into 2 separate sections. 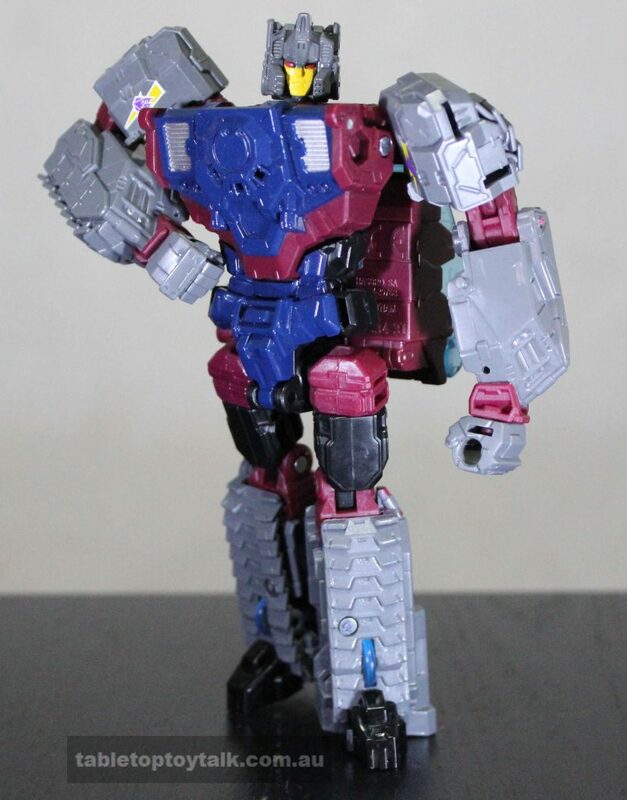 Like most Titans Return figures, his colour scheme is reminiscent of his G1 days, but now he’s sporting a slightly darker blue. 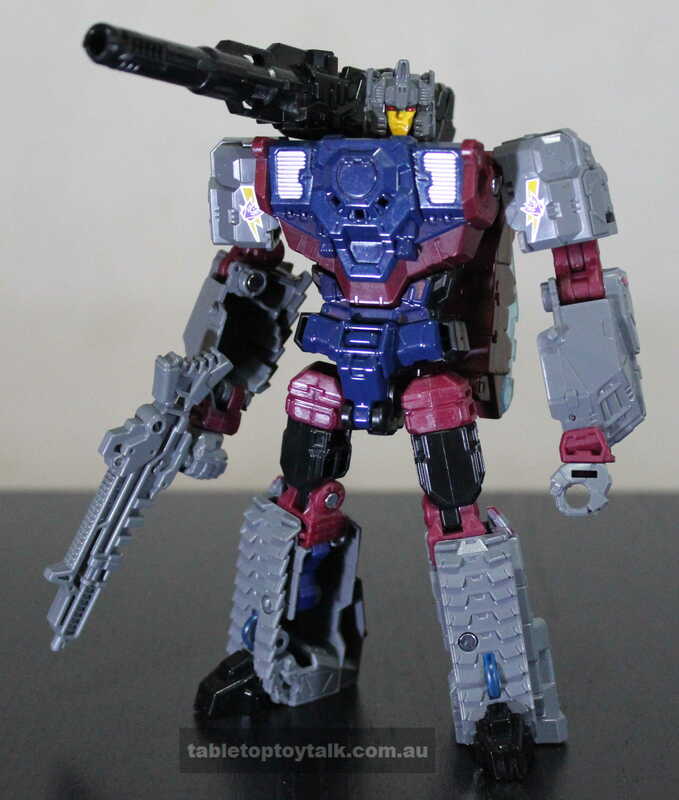 Once out of the package, his robot mode feels sturdy despite all the hollow sections around his body. It’s understandable that some sections need to be hollow in order to facilitate the transformation but to see them on display is a bit jarring. 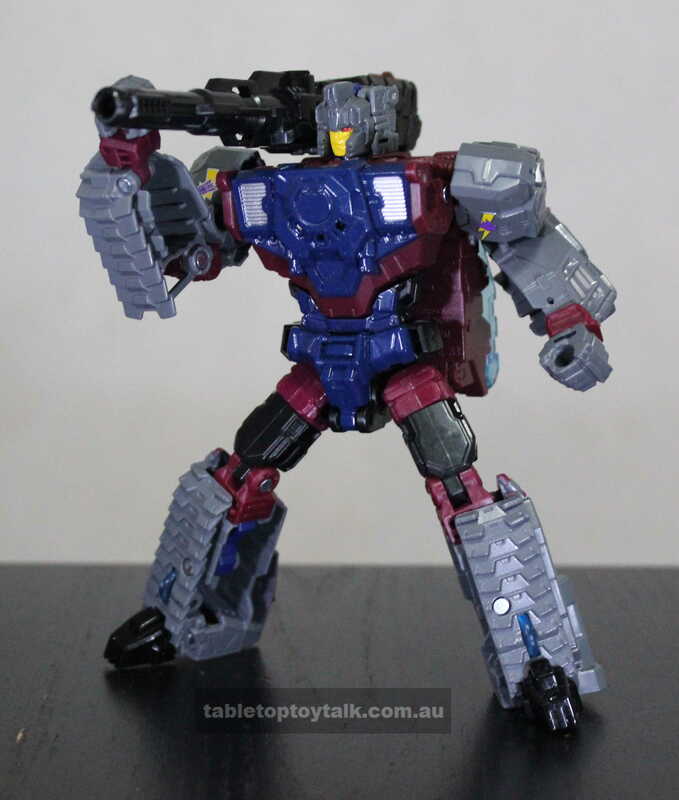 He’s quite detailed for a Deluxe class figure and his colour scheme consists of dark-blue, grey, and maroon, broken up with a large black piece that is the main cannon. 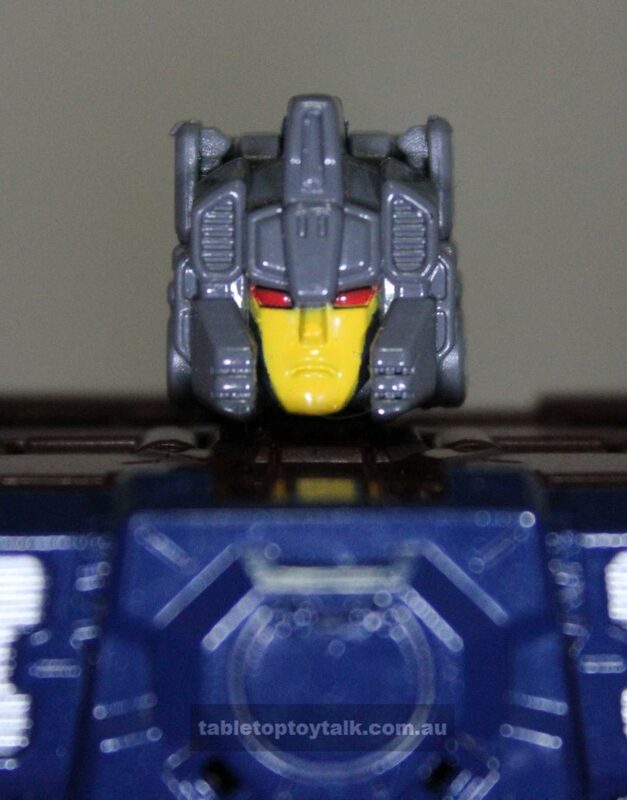 There doesn’t appear to be a whole lot of paint apps here with only a few touches of silver on some vents, and his Decepticon badges with yellow lightning strikes. 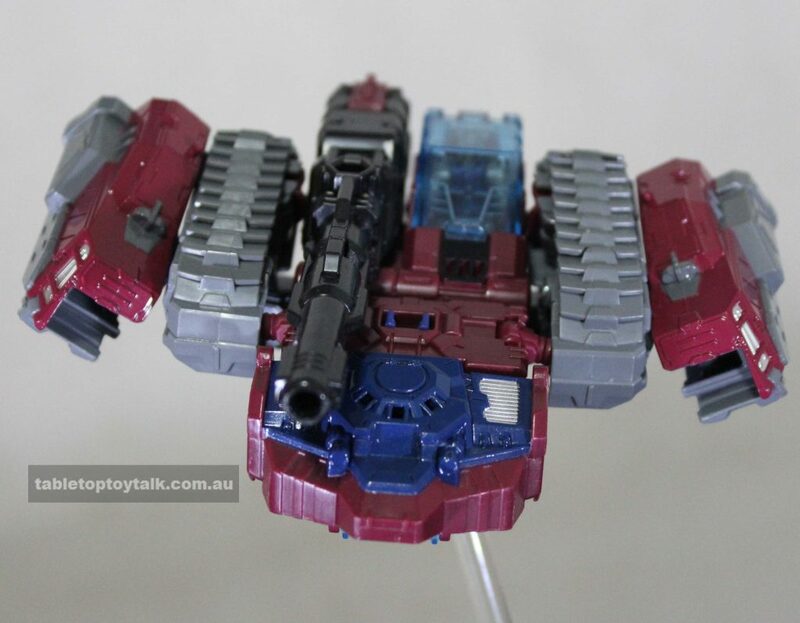 I like how the main cannon can be positioned over his shoulder, but the way that the tank’s cockpit hangs off his back can be slightly distracting. 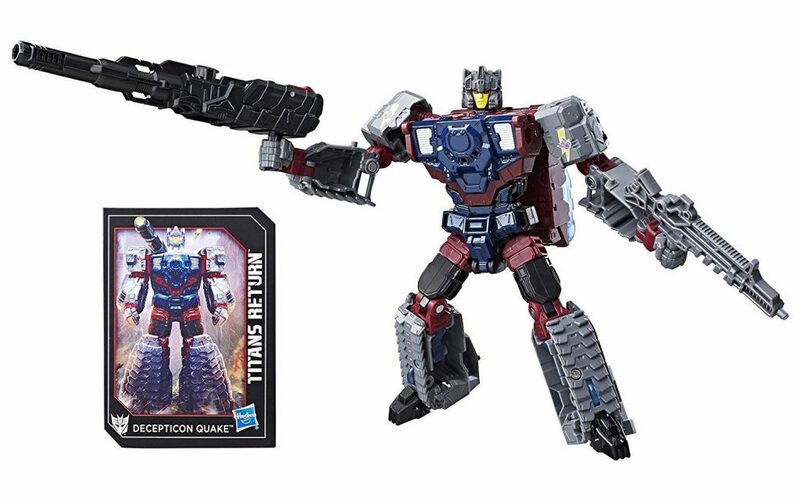 Like a lot of the new Transformers being released lately, he has that “action figure that also happens to transform” vibe going on which is nice. 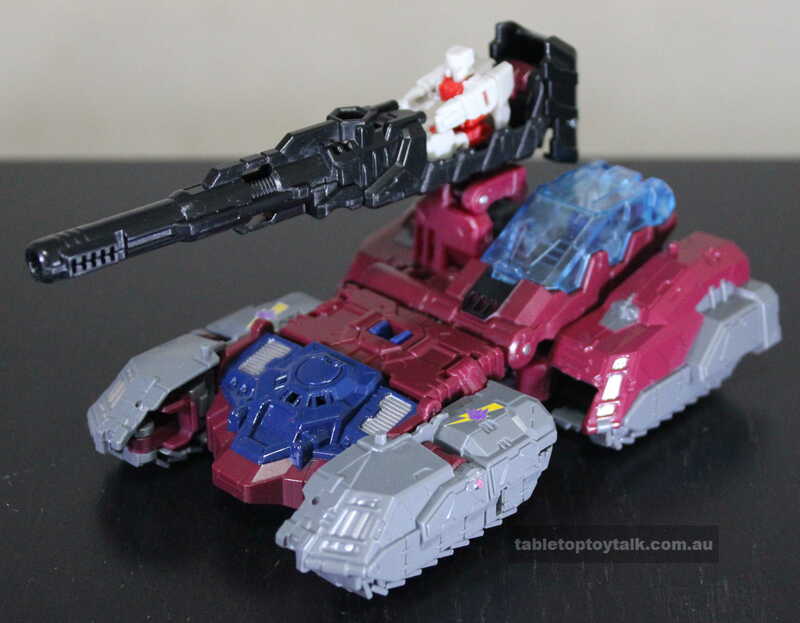 Aside from his rifle, his main cannon can also be removed and used as a hand gun. The main cannon also has a neat feature where the back end can open up and form a seat for Chasm or another Titanmaster to ride in. There are not a lot of accessories here, but it works. Kind of like a “less is more” sort of arrangement. In keeping with the “action figure” vibe, just about everything moves how you would expect it to. 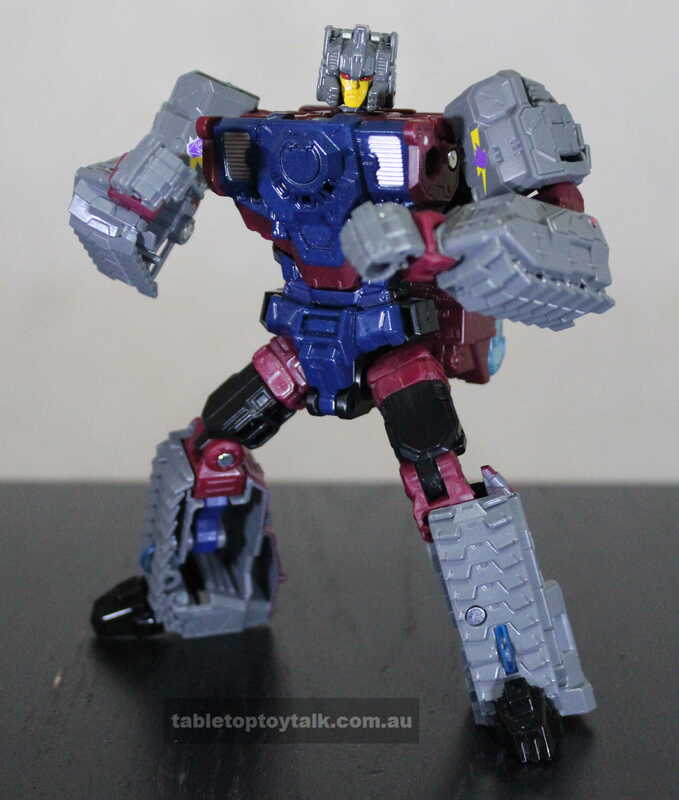 The joints are sturdy enough and he feels like he could hold some dynamic poses. 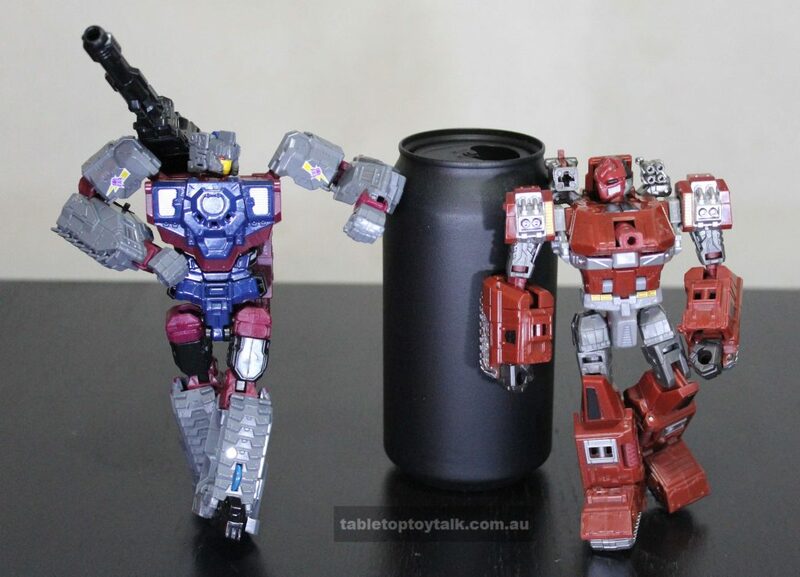 There’s no waist articulation which for me isn’t really a deal-breaker, but it would have been nice. When Chasm becomes Quake’s head in robot mode, they share the same mini ball joint which makes the head feel a bit loose at times. It can still hold its position well enough but the whole thing feels a bit fragile to me. Chasm’s head mode can rotate fully but can only manage a slight tilt back and forth, and left and right. 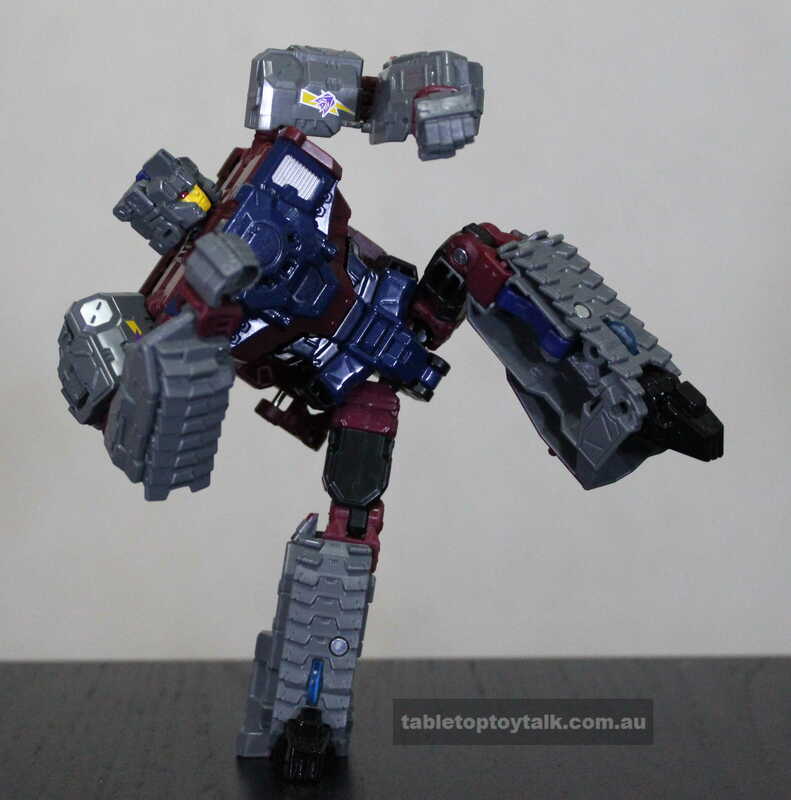 Chasm himself has the standard Titanmaster range of movement. The ball joint in the neck offers full rotation and a slight tilt back and forth, and left and right. The joints in the arms give a decent rotation which is often hindered by the face hanging off his back. The legs have hinges in the knees and hips, but the lower legs are molded into a single piece. So basically all he can do is sit, stand, or fold up into a head. The shoulders have a good range of movement due to the combination of the hinge and ball joint present there. The hinge allows the arms to be raised up at the shoulders past 90 degrees and the ball joint allows for full rotation and some twisting/tilting. At the elbows there is a double joint due to the transformation which helps the elbows bend to just past 90 degrees. There is also a swivel there to turn the forearms in and out which is handy. I was pleasantly surprised to find a swivel at the wrist. Too often I’ve come across a figure that could have really used a wrist swivel only to find out that there isn’t any. The wrists can turn in for the transformation, and it’s a simple thing, but the swivel really helps out with posing. 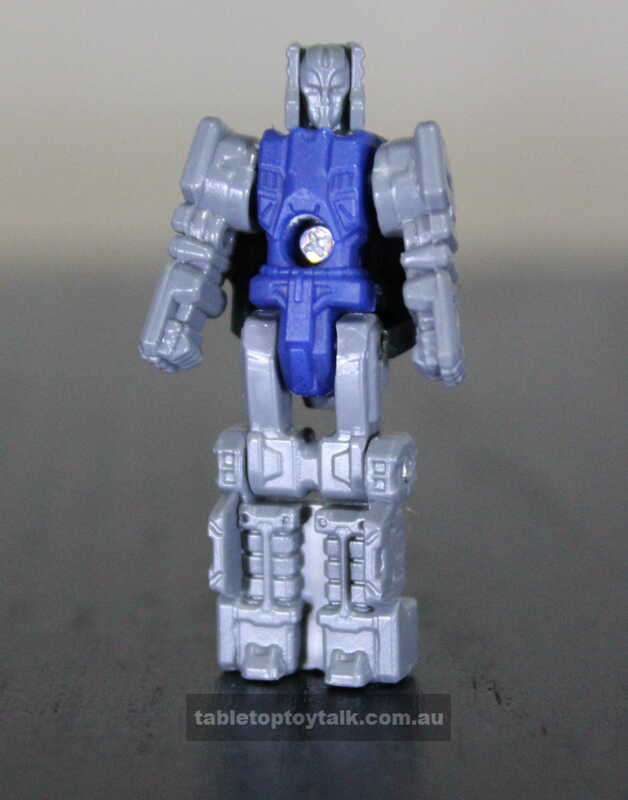 There’s no articulation at the waist, but the ball joints in the hips offer a decent range of movement. Good enough that he can do the splits in both directions. You’ll find a swivel in the thighs and a hinge at the knees that only gets about a 90 degree bend. 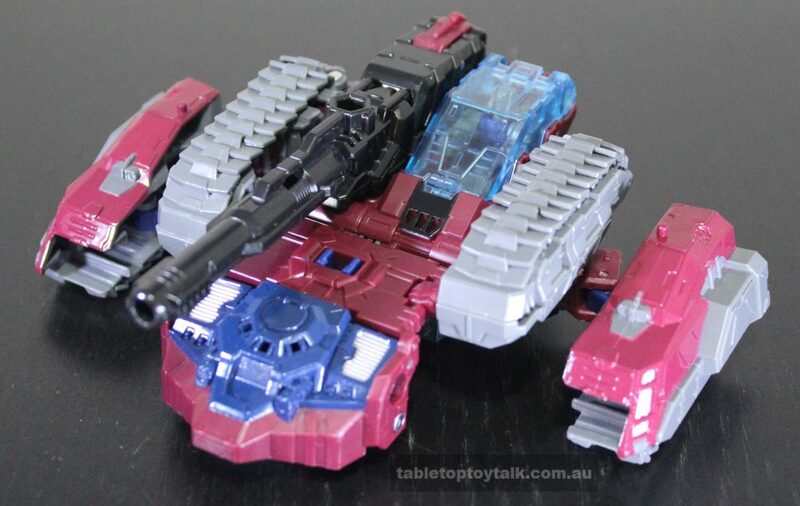 The toes have a hinge but it’s mainly for transforming. 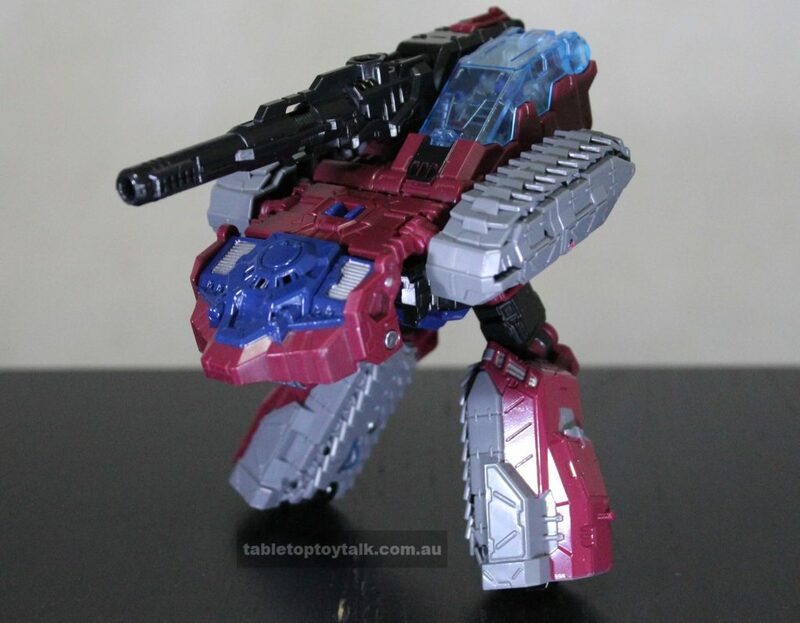 Like some Transformers now, there are no ankle rockers. Instead the bases of the feet have been cut on an angle to facilitate a wider, or more natural stance. 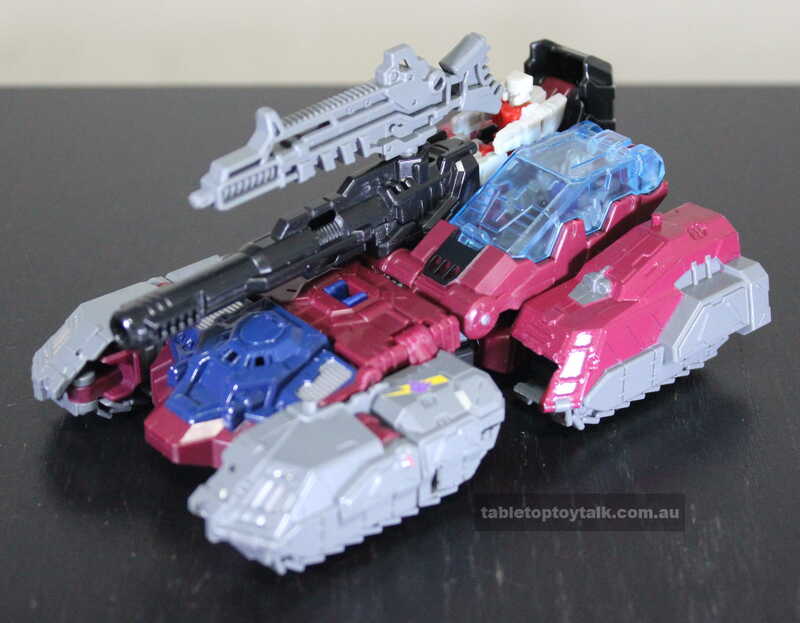 In vehicle/tank mode, there’s not a whole lot of movement going on. Since the treads aren’t the functioning kind, we have to settle for little rollers underneath. 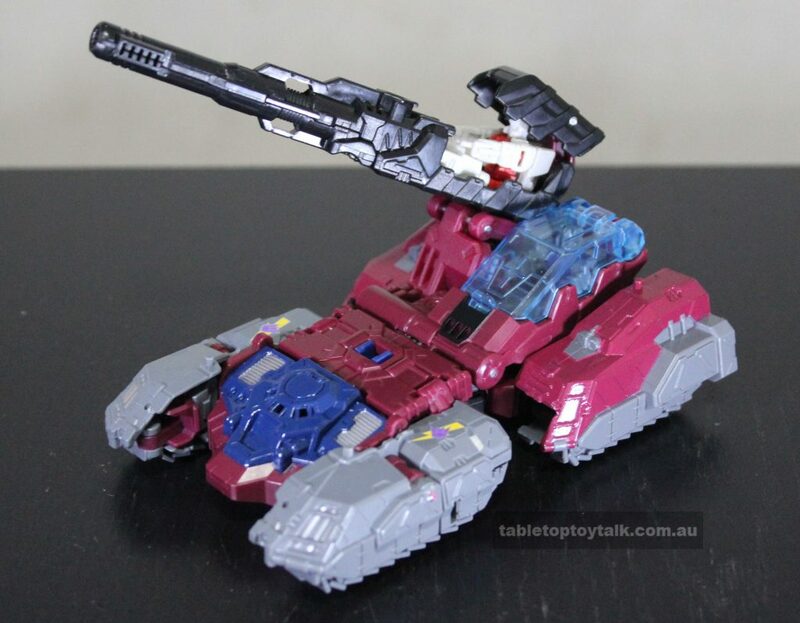 With the way that it’s been designed, there’s no turret to speak of. The main cannon plugs in next to the cockpit, but there are a couple of hinges that can allow the cannon to tilt up and down. You can then pivot the cannon where it connects with the base. 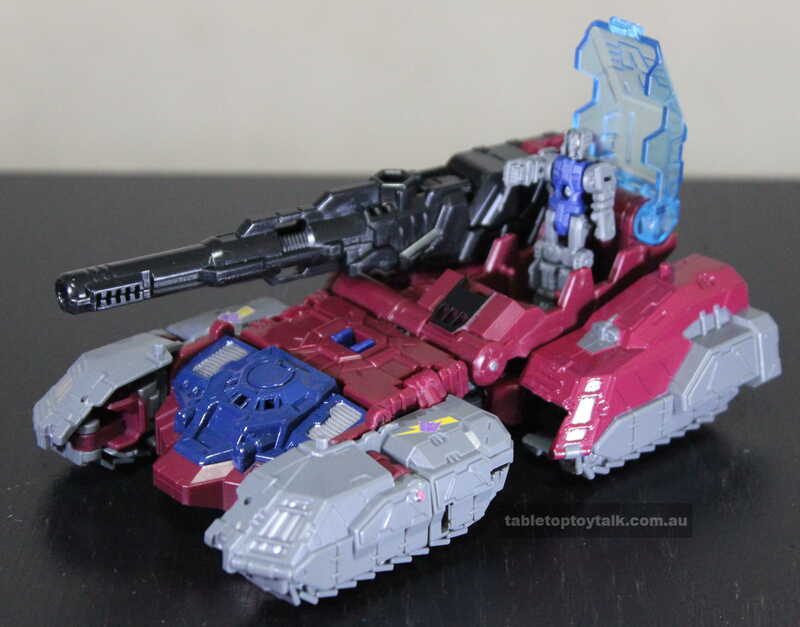 It’s not really a turret in the typical sense, but it’s still poseable. Doomshot can’t resist a shiny new tank to play with. I’m quite pleased with how everything moves with Quake. 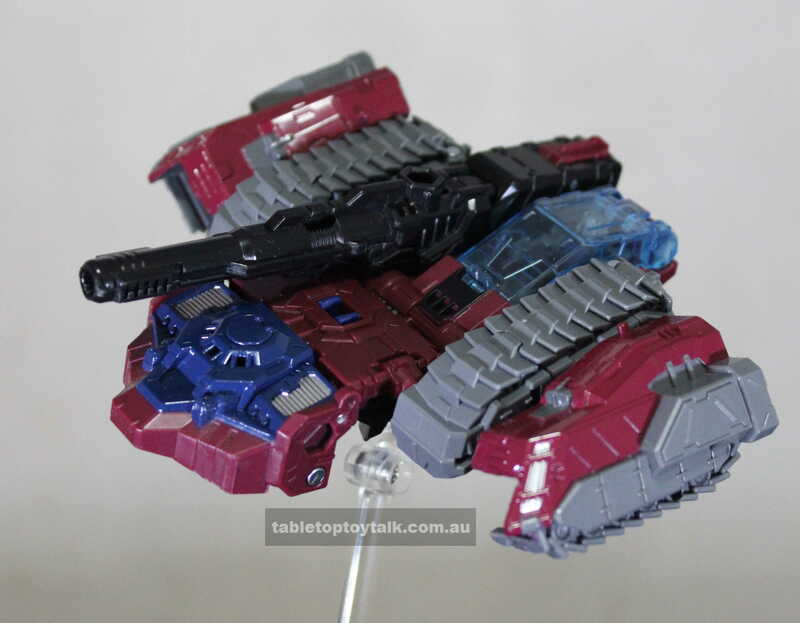 He feels like one of those Transformers that you just want to pick up and play with. 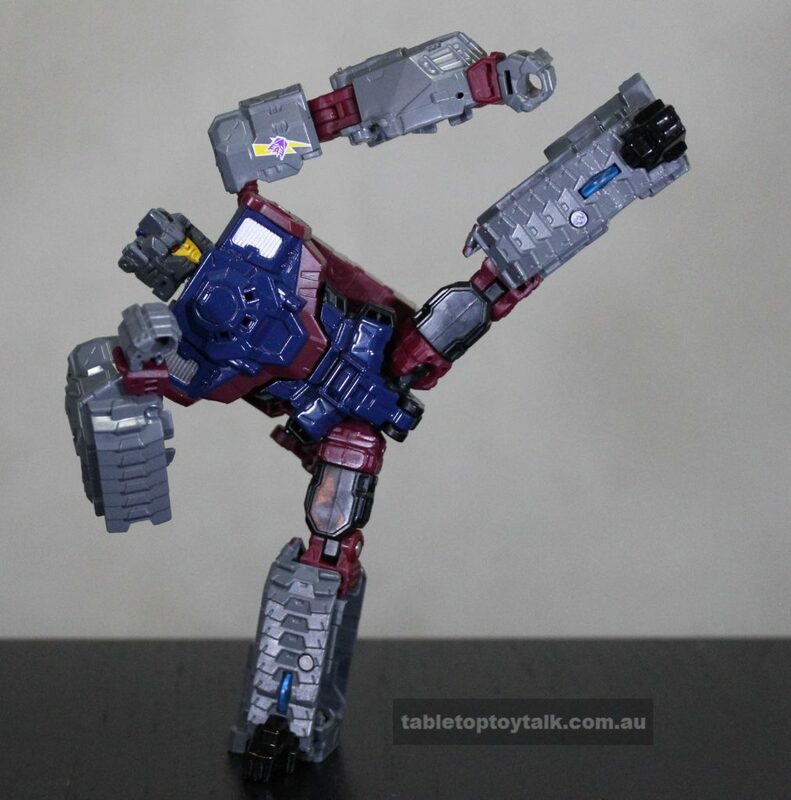 His joints are sturdy and he’s capable of some dynamic poses. The transformation is quite easy and everything tabs in nicely where you would expect it to. I missed out on Hardhead and Furos the first time around, so having Quake and Chasm in my collection make for an ideal replacement. 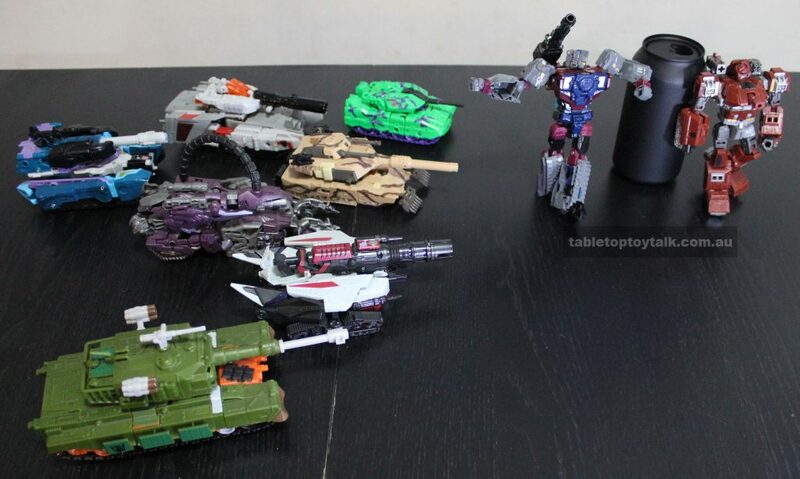 With each new wave of Titans Return figures, it’s interesting to see which classic characters are given a modern update. 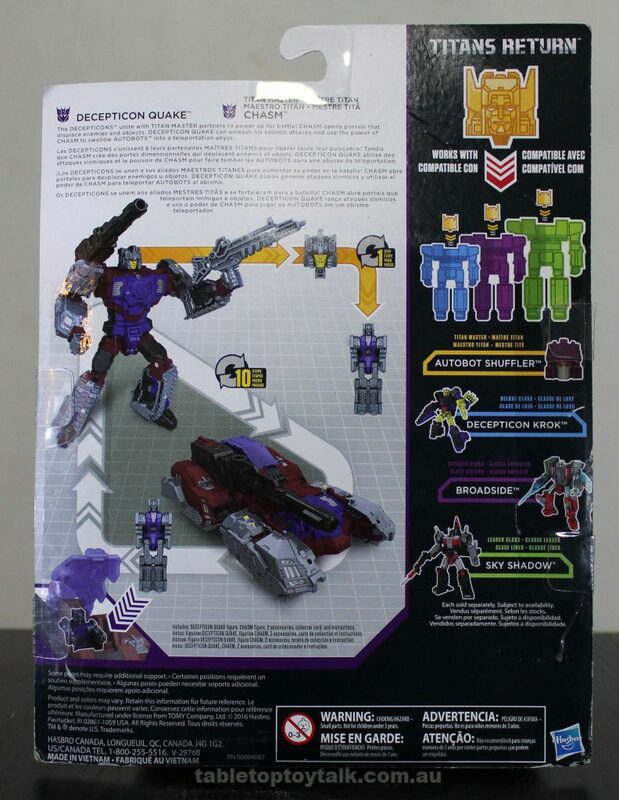 Quake and Chasm can be found at the links below along with other figures in the Titans Return range. SH Figuarts Akiba Rangers – Triple Feature!